What is the Black-Scholes model? The Black-Scholes model, introduced in 1973 by Fischer Black and Myron Scholes, is an option valuation model that is the standard method of pricing options. Why use the Option Evaluation Software? It can help you determine which option to buy, and how many contracts. options are over / underpriced. The Option Evaluation Software is actually quite easy to use. Simply enter the underlying price, price increment, strike price, strike price increment, current T-Bill interest rate, and historical volatility and press “calculate.” The software will then display a matrix of put and call values for six strike prices and eight underlying prices. Click on any particular option value and the Delta, Rho, Gamma, Vega, Theta, and Gamma of Gamma value will be displayed in the “Call Option Greeks” window. Option Greeks are given for each option (Delta, Rho, Gamma, Vega, Theta, and Gamma of Gamma). 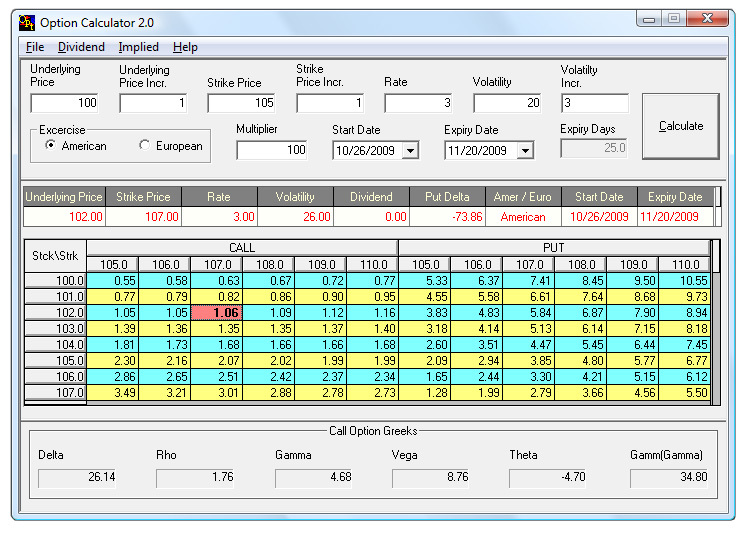 The grid of option values displays option prices at multiple strike and stock prices simultaneously. Choose either American-style or European-style exercise. PC-Operating System Compatible: Windows® 2000, XP Home, XP Pro, 2003 Server, Vista, Windows 7* (download only), Windows 8* (download only), Windows 10* (download only). *NOTE: Software will not run on any MAC OS. The CD-Rom will not work on Windows 7 or Windows 8. To install on Windows 7 or Windows 8, choose the DOWNLOAD option.